Recently, I have found a quick way to estimate the diameter of spherical and elongate projectile fragments using the arc calculators found on the PC and Android and Apple smart phones. 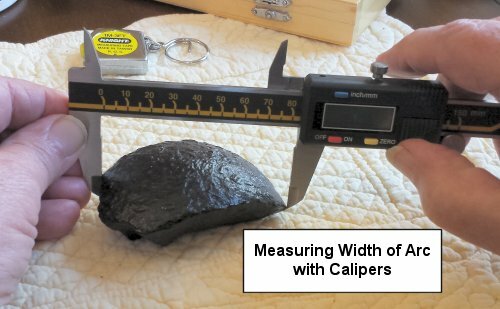 We estimated the caliber of projectile fragments using two measurements: tape Length or arc length is measured with an inexpensive metric tape measure (either metal or fabric) and the caliper width or chord length most easily measured with a digital caliper, Input of these measurements into one of several calculators will yield the radius of the projectile. If you double this value you will get the diameter or caliber of the projectile. Two arc calculator measurements (caliper width or chord length) and (tape length or arc length) used to calculate the diameter of projectile fragments. At this site you will enter your measurement "Length of Arc" as your tape length value and "Width of Arc" as your caliper width measurement. The value under the "Radius of Arc" is then doubled to derive the diameter estimate of the projectile. Be sure to indicate the appropriate units for your measuring devices. 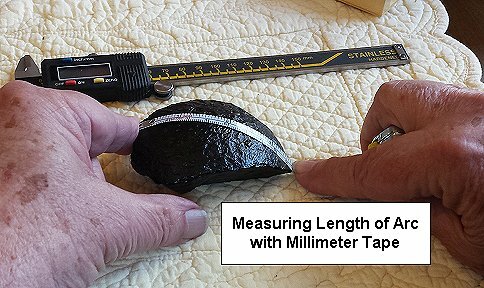 A metric tape will measure in centimeters (cm) while your digital caliper usually measures in millimeters (mm). This calculator will convert your input to inches (in) and you can set the number of decimal places to the typical 3. The radius is doubled to derive the diameter of the projectile in inches. On Smartphone Aps: Android and Apple smartphone apps are available from Play Store (for Android) and the Aps Store( for IOS). The location of this arc calculator can also be downloaded from the PC location above. Both applications are called ArcCalc even though the authors are different. Input the measurements as above and watch that you input the correct units. 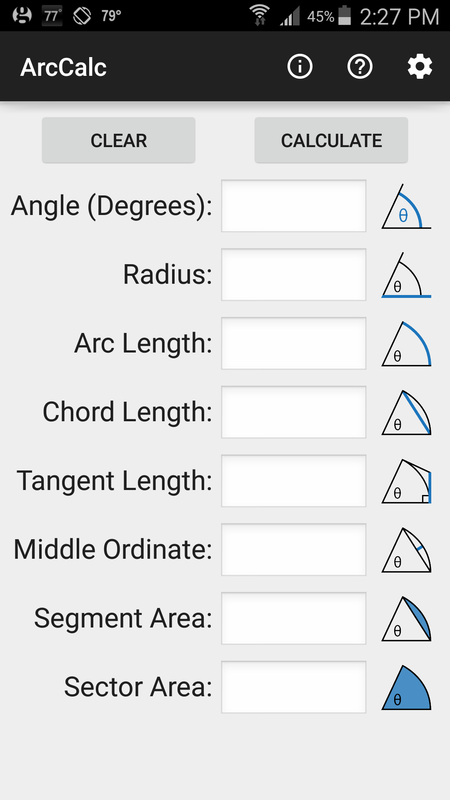 Android ArcCalc display: Input values for Cord Length and and Arc Length and all other values will be displayed including the Radius. All of the above methods yield the same results. Using a 12 pdr. 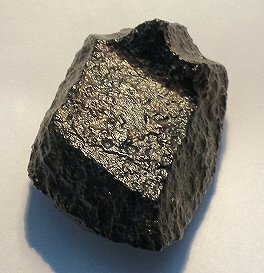 shell fragment, the following measurement s were made with a millimeter tape and an electronic caliper. Measurements were made in the same location on the shell. The arc length was 9.5 cm. and the arc width (chord length) at the same location was 8.5 cm. 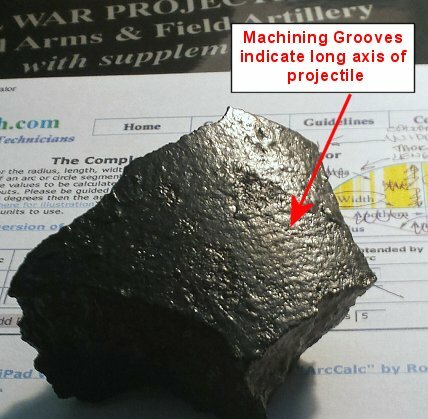 The calculated value for the radius of the fragment from these two measurements was 2.31503 inches and when doubled the diameter was 4.63 inches this compares favorably to the actual diameter of the 12 pdr Confederate polygonal shell of 4.62 inches (which it is). The calculator works for both spherical and elongate projectiles. Confederate Polygonal shell from which above measurements were made. 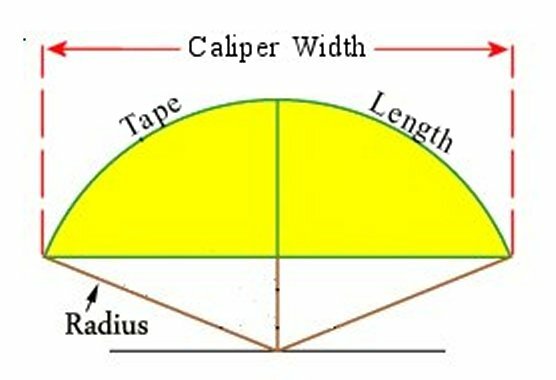 Tape length (same as: Length of arc; Arc length) must always be larger than Caliber width (same as: Width of arc; Chord length). For elongate projectiles, be sure to measure perpendicular to the long axis of the projectile. DO NOT measure the tapered portion of an elongate projectile with the above method. if your fragment contains a bourrelet, measure along the bourrelet Only the bourrelet and the sabot portions of the shell (which we do not have) are in contact with the cannon bore. Estimates of the diameter of the projectile fragment must be made from the curvature of the bourrelet.